You want more people engaging with your church social media, but what kinds of information are they looking for? Why would they engage?? In this episode, Dave and Justin share 4 easy ways you can show your church’s values, strengths, and culture on social media. Facebook groups aren’t a tool that you get hands-on with, but it’s something that you can leverage to learn more and find support for your ministry. Facebook groups have changed the game. You can connect with anyone and anywhere no matter what your ministry is. You’ll find groups for pastors, church techies, ministries, and more! Similar to when youth pastors started to come on staff 30 years ago, church communicators are entering the scene today. But we now have the advantage of technology to pioneer this new ministry together no matter our location. And if you think you’re in too narrow of a niche, like, church lighting, there may still be a group for you. There is even a Church Lighting Designers group currently with over 1,200 members at the moment this is published. Church Storytellers – Led by Brian Mann. This group isn’t too much on the techy side, but more of what you should be pointing your camera at. Social Media For Church – Headed by Kenny Jahng. This group is dedicated to answering your social media questions as well as giving you current news and events in social media. Visual Church Media – A large group run by Jeff Mcintosh of CMG, this group is surrounded by people in church media with a love of graphics, video, and all things visuals. You’ll find a lot of people looking for ideas and support. 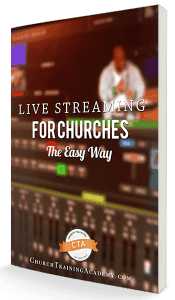 Church Production Gear Traders – Budget is always a consideration when doing anything in the church. Often churches will get new equipment and then after some time find limitations and need to upgrade. This group is a buy/sell/trade group for church tech. You’ll be able to get gear at a really good price as well as speak with the owners to find out settings and problems with your specific purchase. These groups are closed groups. However, if you request access, the groups should approve you to join. Most of these groups just want to vet members to verify they are part of the church and will contribute to conversations. This is great because you don’t have to worry about spammers or salesmen getting into the group. Those that you participate with have been vetted and are in the same season of life as you. Should My Church Use A Facebook Group Instead? More of a broadcasting platform centered around brand awareness and delivering information. ill get less organic reach than groups but give the organization tools like reviews, publicity, check-ins, advertising, and more. Community focused, centering around a niche or cause. Give members more visibility on posts, but only group members can see it (unless public). Groups also lack features like reviews, advertising, and page customization. If you want to compare them, Pages are like a website and Groups are like a forum. Pictures of your church will give visitors the chance to visit your church ahead of time. As we talked about a couple weeks ago, no one comes to church because of a mission statement. We live in a world where we can learn whatever we want at any time. Now people come to church because of the people and environment. Potential visitors want to know what the culture will be like. Are there others like me? Will I fit in? Sharing your church culture will show that you’re a real church of real people. This will attract new visitors. Showcasing your church culture can especially attract people who’ve been burned by the church before, removing any false preconceived ideas of the church. Remember, your church culture is not about announcing what’s happening or making pretty graphics, it’s about showing the people and what it’s like to be a part of the church. Share and give insights into local and current events. Dave’s in-laws went through a couple of years of drought that made life hard in their area. The local churches campaigned together with the hashtag #PrayForRain and brought the community together and gave support in that tough time. We talk about the churches being involved in the community, which means building relationships. So when something is happening, the church can and should provide a Biblical insight. This helps put give perspective and can foster communication in your town. These insight posts will also showcase a glimpse into what’s going on in the church and what the Pastor cares about. These posts work on any platform. BUT make sure you optimize your images for each platform so they display properly across networks. Show people being friendly in your church. If you’re a church that says, “welcome home” or “we’re a family,” you need to show that. Show people that it’s “real” in your church, not just marketing words. Snap pictures of people smiling, hugging, shaking hands, even just talking in the lobby. It may seem weird at first, but once you cast the vision of sharing the church’s values to attract people, the church will come on board. Avoid using ‘professional stock photography’. It’s easy to search for a free image of 2 people hugging, but visitors will know it’s a fake picture. Show the REAL people at your church. Visitors will be pleasantly surprised when they shake hands with someone they saw on the website. It’s subtle but can have an impact. We are not a people of exclusion. The Gospel is for everybody who would listen. Get pictures of all different types of people. For example, if you want to welcome people with tattoos, then share pictures of people in your congregation that have tattoos. It will show that you’re not all talk and not practice. It’s really easy to outsource this work, find someone with a camera or smartphone, and ask them to start looking around for photo opportunities. Keep an eye out for what’s a good reflection of church values while also inviting to new people. You may be concerned about others viewing someone walking around taking photos as being a distraction. Don’t let that scare you. We are past the days of staged photos. We used to stage pretty pictures, but people figured out pretty quickly that this is not an accurate representation of the church. People want to see real life, even if it’s not pretty. So don’t be afraid to walk around with the camera taking pictures of what’s happening as it happens. As you start, little by little, people will get used to it and your members will see the benefits of these photos. Quick hits show people practicing what you preach. People LOVE behind-the-scenes footage. Depending on the size of your church, there can be a relational and emotional detachment from the congregation and the staff. The staff can’t go to lunch every day with someone from the church, but quick hits will allow you to bring the reality of the people in ministry to the forefront. Be fans of your fans. Share what’s going on in the lives of people in your church. There are life events in your church, share them. In Justin’s last church there was a member who got several medals competing the Texas Special Olympics. Sharing his achievement on social media allowed the church to celebrate with him, and he and his family felt the love of Christ from the church. And yeah, that sounds weird, “sharing the love of Christ” online, but it works. Just keep in mind that it’s a good idea to ask for permission to share these events before posting. There will be some people that get upset that something that happened with them isn’t shared. Don’t let that douse your fire. It’s impossible to share everything from everyone. If you miss something and a member complains, just tell them you’re sorry and offer to share it if you think it’ll be encouraging. You may also want to create a set of guidelines of what you’ll share on social media. Then if someone asks, you have something to point to for why you won’t share it. But don’t let the fear of one person ruin the celebration of another hundred. In 11 Posts with High Engagement Rates, Raquel Serrano recommends batching things like birthdays, graduations, and such. So share one birthday post a month or quarter, batching multiple people together as one celebration. There are so many things that we’ve tried and thought would never work…but they did. And we’re glad that we took the leap. The easiest way to start curating content to showcase your church culture is to form a team of people that are always on the lookout. 1-3 people are all it takes. On Sunday mornings or at events, their job is to simply keep an eye out for stories and people to take pictures or videos of. Showcasing your church culture is one of the top ways you can exploit social media to attract new visitors. The days of a using a pretty building or fancy sign to bring in visitors are gone. Potential visitors are choosing their church to visit based on the people inside. Using these 4 posts you’ll be able to easily share your church culture with your city. Have you tried any of these posts? Do you have another type of post that’s working for your church? Leave a comment below! Thanks for going over some tips for social media. I like that you mentioned it could be good to share the church culture because it can attract people. It seems important to also try to share pictures and posts about the culture often, so that people can look at new information as to what’s happening in the church.